Frame design is one of the most important elements in the overall success of your art. To find a frame that compliments your look, rely on our design team's expertise. We'll personally walk you through the process until we find the look that's just right for you. We are experienced professionals ready to find unique solutions for your most challenging work. 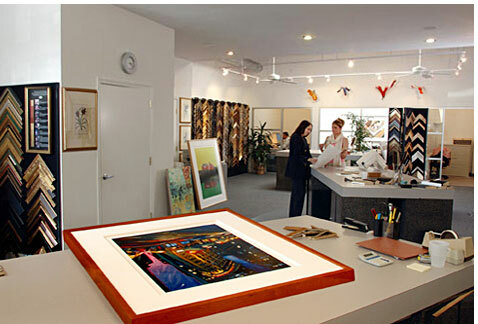 Since 1985, Michael Thompson Framing has been one of the leading full service custom picture framing companies in the Bay Area. Our showroom is conveniently located in the heart of the SOMA design district, close to all major freeways, with parking right in front. Our clientele includes renowned designers, leading architects, Fortune 500 companies and prestigious art galleries. More information here. Frame design is one of the most important elements in the overall success of your art. To find a frame that compliments your look, rely on our design team's expertise. We'll personally walk you through the process until we find the looks that's just right for you. More information about frame design, custom matting options and custom mirrors here. We also offer complete pick up & delivery, professional art installation, packing & shipping and art / frame restoration. More information on all of our services here. Take a look at our framing facility where we use the latest equipment and technology to assure the percision and quality you demand. Tour our framing facility here. Find directions and a map to our facility. Send us an email. More contact information here.